There is a large empty lot a block from my parent’s house that they refer to as “the park,” it’s an odd little park. There is nothing there but three trees and a tiny building. Plus the city usually waters grass in the parks and this one is as dry as a bone. They do mow though as evidenced by the scars on these roots. 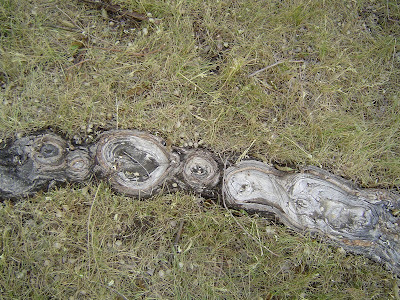 The roots belong to an Elm tree; it looks more or less healthy. Obviously it has found a way to cope with the less than ideal conditions. 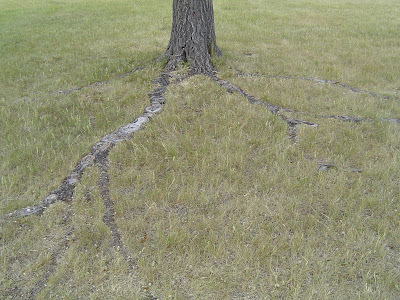 Makes you wonder what’s underneath the tree that forces the roots to grow along the surface doesn’t it? Good capture! Thanks for sharing the photos! Poor tree. Although the pattern is lovely, it makes me sad because I can't think it's a good long-term sign for the tree's health. And what IS under the ground? maybe a septic system or a cistern...? How the plant been coping with the harsh treatment of grassmower again and again... The cut, the scars... A real survivor!! Island gardener, you are welcome, thanks for visiting! Jane, good question! Could be septic. I know this area was only recently converted to sewer lines (with in the last 10 years) and the park is situated so it is directly adjacent to two full blocks of homes. Bangchik and Kakdah, very true. That is what was most intriguing. 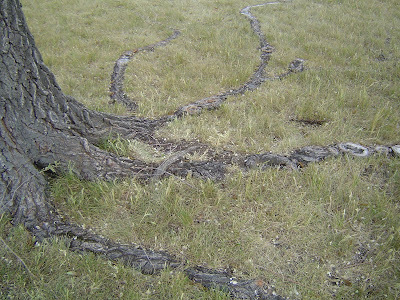 To see the tree from afar it looked like any other but as you got closer you noticed the roots and the scars. I will make this a regular destination everytime I am back visiting in Spokane, to check on how it is doing. Ditto on what Karen said. Can't believe there's an elm that has been abused and opened up to disease and is still in good health. The poor thing. Karen, I agree that there is a beauty to them, even though it is sad. Megan, it is certainly a trooper isn't it.